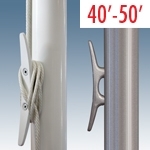 Choose from the categories above for our external rope poles or read more below. If you have any questions or need custom variations, please call us toll-free at 1-877-941-3524. Buy the best quality commercial external rope poles for less at Colonial Flag. Standard: External rope commercial poles are the most basic, standard style of flag pole. This series has a cleat mounted to the pole to wrap or tie the rope around, which is usually placed about 5' above ground level. Buy the best American made External Rope Poles at Colonial Flag. Order online or call us today at 1-877-941-3542 or Contact Us Here. Buy the best quality External Halyard poles for less from Colonial Flag.